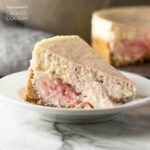 Strawberry Swirl Cheesecake: A dreamy & divine cheesecake you'll love! 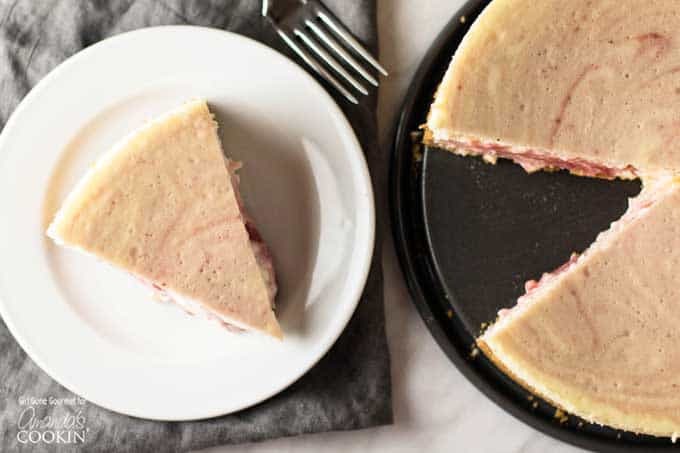 If it’s decadence you’re looking for then this strawberry swirl cheesecake is for you. It’s a towering, rich dessert that will make any occasion special and it feeds a crowd – if you’re willing to share. I first was introduced to this mammoth of a cheesecake six years ago after I moved to Texas, a move that I made by myself during a time of great change in my life. My job at the time presented the opportunity for a fresh start in a new city and, footloose and fancy-free, I jumped at it. So, I packed my stuff and took a lease on a tiny 700 square foot apartment along with a new lease on life. Little did I know, I would soon meet someone who not only became a best friend but who would share her over-the-top cheesecake recipe with me. Friends that come bundled with an amazing recipe is like hitting the friendship lottery. And it was on a lonely new-to a-city Friday night that I first made this cheesecake and my life has never been the same again. Buckling under its own decadent weight this strawberry swirl cheesecake is my go-to for special occasions. I’ve tweaked it here and there, like the pumpkin version I made several Thanksgivings ago, and I share it with you now with some adaptions from the original including a strawberry swirl. It makes for a pretty presentation and the bright, fresh strawberry puree adds a nice contrast to all the cream cheese richness. My good friend, who I miss dearly now that I’m living in North Carolina, has always been happy for me to share her special recipe with readers. It’s that generosity of spirit that I love about her and we still talk about this recipe, how wonderful it is, and how much we love it. She and I will always be bonded by cream cheese and graham cracker dust. This recipe uses simple ingredients and it doesn’t take much elbow grease to make the crust and mix the batter. The only time required is waiting for it to bake and then chill overnight. It can’t be rushed, but I promise the result is well-worth the wait. Use a food processor to make the graham cracker crumbs for the crust or, if you don’t have one, a ziplock bag and rolling pin does the trick. The latter is an excellent stress reliever and sometimes I go the manual route just to release any pent up frustrations. Either way, pulse or beat the graham crackers to a fine crumb. Add some butter and sugar, form the crust and let it chill while mixing the batter. It’s best to use room temperature cream cheese, but if you forget don’t fret. Most of the time I forget this step and use cream cheese straight from the fridge. I let the mixer bash it around a few extra minutes to warm it before adding the sour cream, sugar, eggs, and vanilla. During spring and early summer, when strawberries are at their peak, use fresh ones to make the puree. During the winter, frozen ones work fine. Again, a little advanced planning is ideal so let the strawberries thaw in the refrigerator before pureeing them. Again, sometimes advanced planning never happens so pureeing the frozen strawberries will work, too. Just be aware that they will be thicker (think smoothie consistency) and a little tougher to swirl. Some the puree may sink into the cheesecake providing a little fruity surprise in each slice. Doesn’t it look divine? If you love cheesecake, check out more delicious and mouth-watering cheesecake recipes like this Brownie Mosaic Cheesecake, this Chocolate Chip Cheesecake, or these Mini Turtle Cheesecakes. Enjoy! Rich and decadent with a bright and fruity strawberry swirl, this cheesecake is an impressive dessert for special occasions. Make it a day in advance to give it time to chill overnight in the refrigerator. Mix the graham cracker crumbs with the butter and sugar until well combined. Wrap a 9-inch spring form pan with tin foil (to prevent any leaks). Place the graham cracker crumbs in the bottom of the pan. Using your hands or a measuring cup, lightly press the crumbs into an even layer along the bottom and up the sides of the pan. Chill the crust while you make the filling. In a stand mixer fitted with the paddle attachment, mix the cream cheese until its creamy, about 2-3 minutes. (if using cold cream cheese, this may take a few additional minutes). Add the vanilla and sugar and mix, stopping to scrape down the sides, until combined. Add the eggs, one at a time, and mix until incorporated before adding the next one. Sprinkle the flour in and mix. Scrape down the sides of the bowl and mix in the sour cream and heavy cream. Pour the filling into the pan. Dot the top of the filling with the strawberry puree and, using a dinner fork, gently swirl to get a marbled effect. Bake the cheesecake for 20 minutes at 325 degrees. Lower the heat to 300 and continue baking for another 40 minutes. Turn the oven off and leave the cheesecake inside, with the door closed, for an hour. The cheesecake will still be a little jiggly in the center when it's done. Let it chill in the refrigerator over night before slicing and serving. I used pretty big dollops of puree, some of which sunk into the cheesecake. 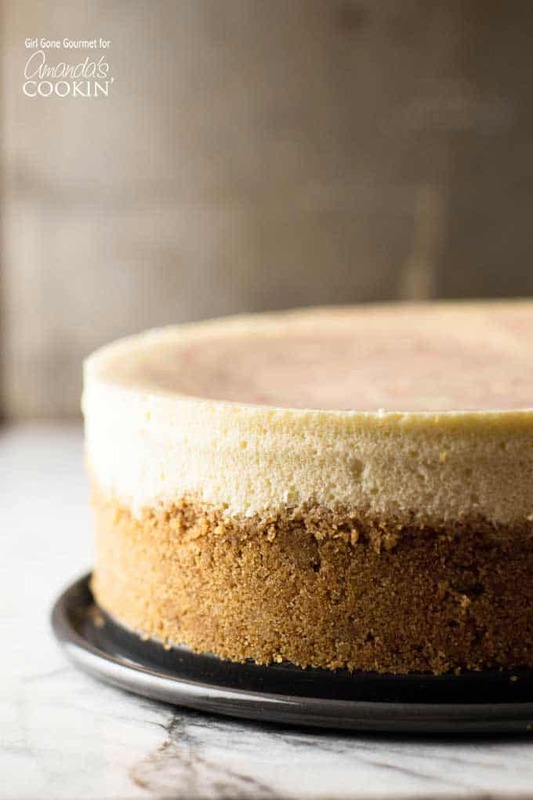 I love slicing into a fruity center, so if you take this route be aware that the puree may destabilize the center a bit making parts of the cheesecake less firm. I keep the puree mostly on the top of the cheesecake, drop smaller amounts and swirl lightly.